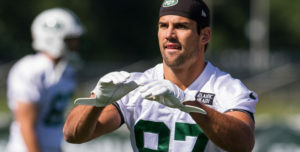 Eric Decker was named the National Football League player of the week after snagging four touchdown passes when the Broncos played the Kansas City Chiefs last Sunday. But not all of his scores have come on the gridiron. In the process, they have helped Freedom Service Dogs, Inc. have a banner year. The Englewood nonprofit has a program for post-combat veterans who need help, called Operation Freedom. Deckers Dogs is helping that cause. Some vets who have seen action come home with wounds and disabilities – including the kind that are not readily visible. Candella reels off examples: Some commit suicide, some suffer night terrors, some are afraid to leave their homes. “By giving them a (trained) dog it gives them independance … more confidence,” she said. Candella added that there are 80 veterans on a waiting list for dogs. That’s where the Deckers come in. When Eric and Jessica Decker visited Operation Freedom, the message resonated with them. Jessica is a military brat and the couple has three dogs. After hearing heart-wrenching stories about the difficulties some vets have had re-entering society, tears flowed. 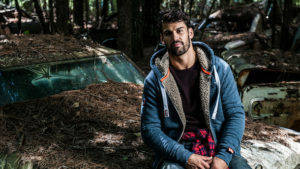 Deckers Dogs was launched with the mission of providing dogs for Operation Freedom. Partly because of the Deckers’ help, 2013 has been a good year for Freedom Service Dogs, Candella said. “We put on a lot of events this year and two sold out,” she said. In addition, the organization received a grant from Pure Communications, a Denver ad agency, which helped the organization ramp up its public profile. Monthly hits on its website increasedfrom 700 in January to 12,000 in October. Freedom Service Dogs was featured on billboards and signs on bus shelters and RTD buses. The organization is in the third year of a caital campaign to move to a new location where it can train more dogs. Freedom Service Dogs helps a variety of people with disabilities by rescuing dogs and custom training them for individual client needs. The organization provides lifetime support to its client-dog partners. It takes months to train a dog as well as thousands of dollars, so volunteers and continuing public support are vital to their mission.